Some songs just take you back. 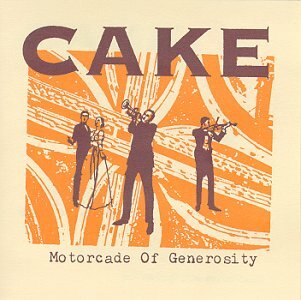 “Rock ‘N’ Roll Lifestyle” by Cake takes me back to the summer of 1994 and my days as a Kroger bag boy. We had a Blockbuster Music right next door and I spent every work break at their listening station. This was a bank of chairs and cd players and you could pull anything off the shelves to listen to. I blew that place up and I know they got sick of seeing me two or three times a day for the whole summer. Motorcade Of Generosity was practically a daily selection for me. I had never heard a band like Cake before. Overdriven 3/4 acoustic guitars, noodley electric guitar runs, hilarious lyrics, vocals that seamlessly shifted between smooth and spazzy and mariachi horns! Beneath it all was some really great songs too! Even after I bought it with my first week’s tip money, I still listened to it at the listening station pretty regularly because it put me in such a good mood for the rest of my shift. I learned how to play “Rock ‘N’ Roll Lifestyle” on my guitar pretty quickly and would whip it out every chance I got. Even my friends who hadn’t heard of Cake would ask me to play it because it was so catchy and fun to sing along to. In fact, when I was in 10th grade the band I was in played a 50’s-60’s sock-hop themed birthday party for a friend of ours and they asked me to play it. It sounded kinda funny played along side “I Wanna Hold Your Hand”, “Jailhouse Rock” and “Happy Together” but it somehow worked. I’m pretty sure the adults that were there enjoyed the tongue in cheek lyrics too. Cake can still instantly put me in a good mood and transport me back to a time where I looked pretty darn smokin' in some khaki shorts, a white polo shirt and my Kroger name tag. Will that be paper or plastic, ma’am?